Melbourne non-profit, Yarra Swim Co, has teamed up with UK architects to visualise what it might look like to swim in the Yarra in the near future. The Yarra Pool concept design is one of the many visual treats featured in the broadsheet publication of The Pool*, Australia’s Venice Biennale Exhibition which opens this weekend. Yarra Swim Co is leading the push for a swimmable Yarra. In 2014, they announced plans to revive the historic Race to Princes Bridge, which ran from the early 1900s till the 50s, and then again for three years from 1987-89. At one point the race was the biggest open water swimming race in the world. The race may be still be some way off, however swimming in the river might be closer than expected. Waterway pools are a growing concept globally, with famous examples already in place in Berlin, Paris and Zurich, and plans underway for New York and London. London’s concept is the Thames Baths’ which was launched in 2013 and has since gathered substantial international support, including a successful crowd-funding campaign raising over £140,000. The practice is now working with commercial sponsors and partners to deliver the scheme in central London. The architects behind the Thames Baths, Studio Octopi, who produced the conceptual design, are making a name for themselves designing visionary renderings of urban lidos. 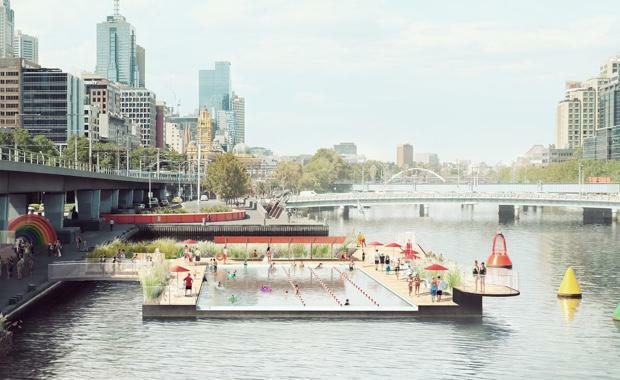 Their rendering for the Venice exhibition, in collaboration with Yarra Swim Co, includes a 25m lap pool and a smaller children’s play-pool within a planted, floating pontoon. Spectacular views of Melbourne’s CBD are realised from the water and surrounding decks, while changing facilities and a café support the proposal, serving to activate the river bank and provide a vibrant new public destination in Australia’s rapidly growing cultural capital. Preliminary discussions have been held with a number of key stakeholders to explore potential sites and opportunities for delivery of the concept. A patent is currently pending on a locally developed technological solution that may allow river water to supply the pool. The Melbourne inventors will be conducting further testing over winter. Preliminary advice and support for the concept has been offered by global engineering and design firm Arup who are working on a variety of urban plunge projects around the world including New York’s +Pool. Cost estimates for the Yarra Pool’s construction are between AU$6 – 8 million. A mix of sponsorship, grants and debt equity would likely to make up the total. Crowdfunding could also be an option in the early stages. A key driver behind the proposal is an ambition to change people’s perception of the river and drive support for improving its quality. Similar waterway pools exist in Copenhagen, where that city’s Harbour Baths have been a catalyst for drastically reducing pollution in the urban water systems. A pop-up version is being developed in conjunction with the Committee for Melbourne’s Future Focus project group, Yarra Splash, and could see Melburnians testing the concept as early as next summer.